Brunello di Montalcino "Annata" by Biondi Santi is the result of two hundred years of in-depth studies devoted to peculiar clones of the Sangiovese Grosso grapes selected at the "Greppo " estate . It's a very typical wine with an extremely long ageing, coming property vineyards that are 10 to 25 years old. It is produced during exceptional harvest years. During vintage years that are not reputed extraordinary enough for a Brunello di Montalcino "Reserve" production, all the grapes harvested the over 25 years old vineyards are employed for Brunello di Montalcino "Annata" too. Each step of the working process is followed with extreme care and the wine ages three years in slavonian oak barrels. The very best vintages may last in bottle thirty to fifty years! "Gilbert & Gaillard" has rated the wine "Biondi Santi Tenuta Greppo Annata, Brunello di Montalcino DOCG, Italy" from the vintage 2011 on 01.06.2016 with 95 of 100 points.
" Medium intense hue with bricking. Extremely refined nose intermixing prune, cherry, Havana and mild spices. Tightly-wound, silky tannins on the palate are lifted by a wave that is full and ethereal yet remarkably fresh. Elegance and delicacy. " "Gilbert & Gaillard" has rated the wine "Biondi Santi Tenuta Greppo Annata, Brunello di Montalcino DOCG, Italy" from the vintage 2010 on 30.06.2015 with 96 of 100 points.
" Orange-brown. Profound, elegant nose recalling Autumn leaves and cep mushrooms. Full yet ethereal, structured yet silky palate that is generous and fresh. The finish is taut with a seductive touch of austerity underscoring the sensation of elegance. Top class. " "Gilbert & Gaillard" has rated the wine "Biondi Santi Tenuta Greppo Annata, Brunello di Montalcino DOCG, Italy" from the vintage 2009 on 24.07.2014 with 93 of 100 points.
" Garnet with ruby highlights. Full, harmonious nose of rose, violet and undergrowth with fruit notes of morello cherry, redcurrant and citrus then mint, tobacco and sandalwood. Delicious palate showing elegantly austere, noble tannins. Very fresh and long. " "Gilbert & Gaillard" has rated the wine "Biondi Santi Tenuta Greppo Annata, Brunello di Montalcino DOCG, Italy" from the vintage 2008 on 22.07.2013 with 95 of 100 points.
" Brilliant ruby. Open nose delivering perfumes of prune and spice (black pepper) with a touch of mint in the background. Full, fresh and elegant palate showing a lovely, closely-integrated tannin structure. Persistent finish. Serve with meat. " 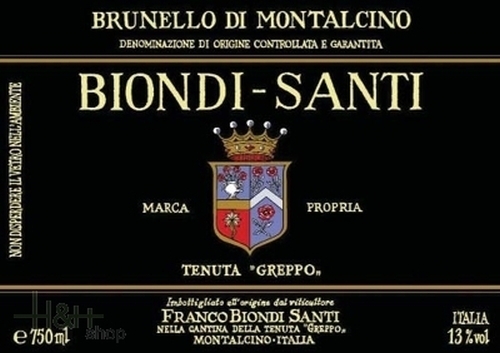 "Doctorwine" has rated the wine "Biondi Santi Tenuta Greppo Annata, Brunello di Montalcino DOCG, Italy" from the vintage 1999 on 18.02.2012 with 90 of 100 points.
" This was opened right after the other Brunello and it was immediately a different story. Its color was already less dark and less shinny, the nose truly subtle but with a whispered persuasion. The taste is truly athletic, agile, fresh. Made up of leather, tobacco, black fruits. All in a framework of great sincerity and austerity, an austerity I would define as rustic, peasant, sincere, real. I hope I have been able to explain myself. " 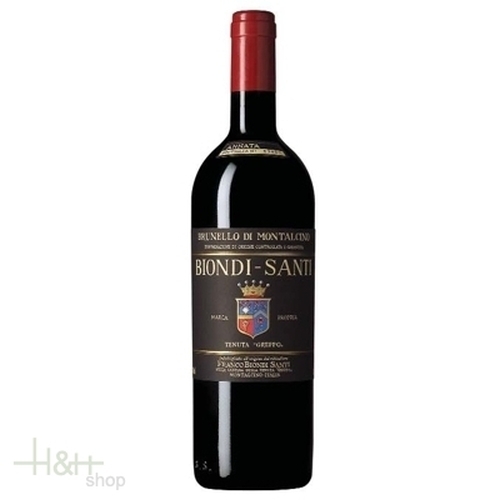 "Doctorwine" has rated the wine "Biondi Santi Tenuta Greppo Annata, Brunello di Montalcino DOCG, Italy" from the vintage 2004 on 17.09.2011 with 92 of 100 points.
" Made from Sangiovese grapes. I donâ€™t agree at all with James Suckling, the â€œWine Spectatorâ€�â€™s correspondent in Italy, who has criticised it heavily, demonstrating once again that he doesnâ€™t understand and appreciate all the nuances that a wine like Brunello has to offer. Here we have a classic example of the traditional style, moreover from a vintage that highlights those characteristics. We have, therefore, a bright ruby colour and intense, elegant perfumes of sour cherries, but also of raspberries and violets, with a hint of smokiness that is a prelude to the development of tar-like sensations. The fruit on the palate is full-bodied and perfectly sustained by acidity that accompanies it through to the long yet restrained finish. Serve it at 18Â°C with roast saddle of pork, rack of lamb with thyme or an assortment of boiled meats. " "Gilbert & Gaillard" has rated the wine "Biondi Santi Tenuta Greppo Annata, Brunello di Montalcino DOCG, Italy" from the vintage 2004 on 18.07.2011 with 96 of 100 points.
" Deep ruby-red. Nose of macerated plum underscored by a mineral dimension verging on austere. Full, well-structured palate with closely-integrated tannins. The finish is particularly concentrated and long, intermixing fruit, liquorice, mintâ€¦ A majestic wine. " "Gilbert & Gaillard" has rated the wine "Biondi Santi Tenuta Greppo Annata, Brunello di Montalcino DOCG, Italy" from the vintage 2006 on 18.07.2011 with 92 of 100 points.
" Dark ruby-red. Very elegant, delicate nose of fruit caramel, violet and mineral notes. Full, concentrated palate showing great consistency and supported by savoury exuberance. Wonderful sense of place. Drink with meat. " "Falstaff Magazin" has rated the wine "Biondi Santi Tenuta Greppo Annata, Brunello di Montalcino DOCG, Italy" from the vintage 2012 on 17.03.2017 with 94 of 100 points. "Luca Gardini" has rated the wine "Biondi Santi Tenuta Greppo Annata, Brunello di Montalcino DOCG, Italy" from the vintage 2012 on 01.01.2017 with 96 of 100 points. "Decanter World Wine Awards" has rated the wine "Biondi Santi Tenuta Greppo Annata, Brunello di Montalcino DOCG, Italy" from the vintage 2012 on 01.01.2017 with 85 of 100 points. "Luca Gardini" has rated the wine "Biondi Santi Tenuta Greppo Annata, Brunello di Montalcino DOCG, Italy" from the vintage 2011 on 01.07.2016 with 97 of 100 points. "Falstaff Magazin" has rated the wine "Biondi Santi Tenuta Greppo Annata, Brunello di Montalcino DOCG, Italy" from the vintage 2011 on 18.03.2016 with 95 of 100 points. "Robert Parker The Wine Advocate" has rated the wine "Biondi Santi Tenuta Greppo Annata, Brunello di Montalcino DOCG, Italy" from the vintage 2010 on 01.03.2016 with 95 of 100 points. "Wine Enthusiast" has rated the wine "Biondi Santi Tenuta Greppo Annata, Brunello di Montalcino DOCG, Italy" from the vintage 2011 on 05.01.2016 with 94 of 100 points. "Luca Gardini" has rated the wine "Biondi Santi Tenuta Greppo Annata, Brunello di Montalcino DOCG, Italy" from the vintage 2010 on 01.07.2015 with 94 of 100 points. "Falstaff Magazin" has rated the wine "Biondi Santi Tenuta Greppo Annata, Brunello di Montalcino DOCG, Italy" from the vintage 2010 on 20.03.2015 with 92 of 100 points.